This is kind of a new thing for me, being informed about new restaurants before they open. I received word that the very first Chipotle location in Schenectady is opening on Tuesday, November 29 at Mansion Square Commons, a hop, skip, and jump away from Mohawk Commons. Fans of derryX.com know that I regularly dine at Chipotle, as it fits well within the parameters of how I like to eat while I am working out. I am glad to have been informed about this new location. This year Chipotle expects to use over 10 million pounds of produce from local family (within 350 miles) farms throughout the 2011 growing season, up from 5 million pounds in 2010. All the pork, beef and chicken Chipotle serves is naturally and humanely raised. Sour cream and cheeses are made from milk that is rBGH-free (recombinant bovine growth hormone)…35 percent is from pasture-raised cows. 40 percent of the black and pinto beans that Chipotle purchases are organically grown with about 5 percent using conservation tilling methods. While all Chipotle restaurants use similar materials to achieve a sparse, clean, urban look, no two are alike. All of these factors, which I already had an idea about, should make you feel good. There is a food revolution right now. Farm-fresh and local, sustainable agriculture is making progress, and it is places like Chipotle that are helping to facilitate this. 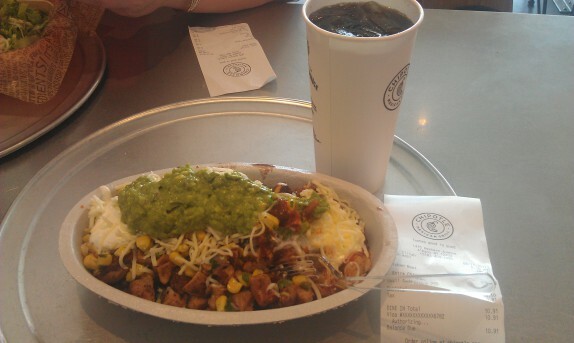 I LOVE Chipotle. It’s my go-to when I don’t feel like cooking but want to still eat something that won’t clog my arteries or supports factory farming. I just read your other post. I have the Chipotle app for the iPhone. You can place your whole order on it and even submit payment. When you go in (if you’re not defeated by the heavy door at Stuyvesant Plaza), you just walk to the register and they hand you your bag. No line, no stress. In defense of their mild salsa, it actually makes for a decent replacement for tomatoes (since there are none) – and then add other salsa on top of it. Oh, also, in regard to their chips – I saw someone actually tossing chips with salt and lime juice one time when I was there, so I’m not sure if they really get them from a box. You can only toss with salt and lime when they are fresh and hot. I probably should have posted this comment to your other post. Ha! What did you say after “I dine at Chipotle?”.